Ron Blomberg. The First DH. It’s hard to explain all this to someone who doesn’t see things the way you do. But, in such a complicated and challenging world there is much to say for a game that is so simple and carries so many memories with it. If a boy from 1896 found himself somehow here today, his heart would tighten at the sight of cars and rocket ships and computers and women in pants and all the old people who aren’t dead yet and those other things of life that are so different now from then. But, if you sat that kid at a baseball game he’d recognize it. Sure, the Jumbotron and hotdog race would confuse him at first, but he’d find the game pretty much as he left it when he left 1896. Maybe he wouldn’t. But, to fall in love with baseball is to believe that he would. To be certain that he would. Baseball’s changed, of course. But to fall in love with baseball is to believe that it hasn’t. It’s like going to your parents’ house for Christmas. You’ve grown and changed. You’re on your own. But, still, they put you back in your childhood room. And, after the hugs and hellos something strange begins to happen. You start to become 13 again. To be in love with baseball and to go to a game is like that. You watch the game and you start to become the person who watched the game as a child. And, the game takes on its own sepia tones. That one game becomes all the games you’ve seen and all the games you’ve read about. You’re too young to remember Wee Willie Keeler or Babe Ruth or Satchel Paige or Jackie Robinson, but you start to remember them anyway. You can see them there in the game that you’re watching. To miss baseball in the off-season is to think about baseball whether from 1896 or 1996 or just last October with a strange sense of longing. Longing for something that has only been gone for a few weeks. I drank a Yoo-hoo today. The first in, oh, probably, 40 years. Not because I wanted to. No one over the age of 12 wants to drink a Yoo-hoo. I drank it because it reminded me of baseball. Although, as you can see, it is. You know, it was pretty sweet, but the Yoo-hoo wasn’t bad at all. It’s been 10 weeks since baseball. 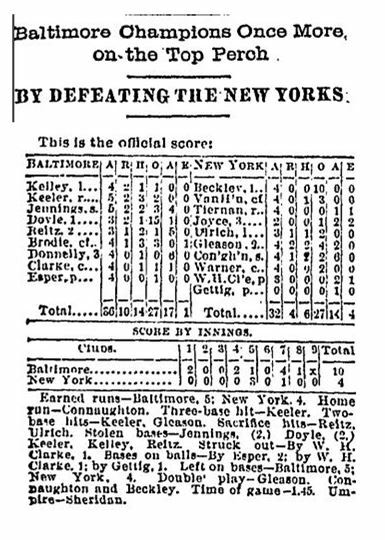 This entry was posted in Baltimore Orioles, Baseball, Baseball History, Life and tagged 19th Century Baseball, baseball history, Wee Willie Keeler, Yogi Berra, Yoo-Hoo by Jackie, The Baseball Bloggess. Bookmark the permalink. Hi Gloria … I’m a big fan of Satchel Paige … he’s one of my favorites! 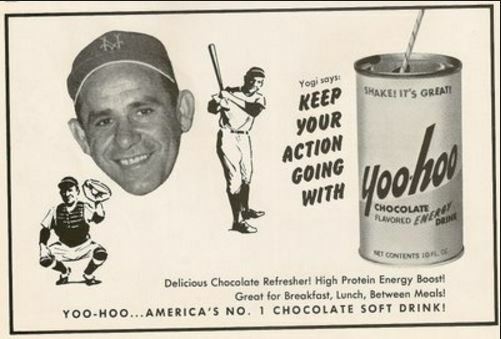 I learned three things about Yoo-hoo yesterday: 1) it was invented in the 1920s, 2) It IS hyphenated and the “h” in hoo is lower-case, and 3) it simply tastes like chocolate milk that is more sweet than chocolate. I was afraid it would be vile, but it was merely very very sweet. Learn something new everyday, that’s my motto! My love of Baseball has a lot to do with the sound of a game, on the radio, and that’s mostly how I experience games now, from April to October (and, hopefully, not beyond). Since I’m a Giants fan, that means the sound of Jon Miller and Dave Flemming. There is just something about the sound of a game, being called by people who feel like old friends that makes me relax and just feel good. I love to sit out on the patio on a long, warm evening with a cold beer (or two), and listen to the play-by-play. When I was a kid, before every house was air conditioned and windows were open, you could hear the same baseball game, coming from up and down the street. That’s really how I learned to love baseball- and, I guess, that’s why I don’t feel I have to actually attend games to follow the sport, although I do, occasionally, go to one. I have to say, though, that you’ve got me curious about this “Yoo-Hoo” thing. I’ve never had one, and my life may be poorer for that. I wonder if they’re even available, here on the Left Edge. Have to check that out. Hi John … My only other Yoo-hoo’s came from when I was a kid … east of San Francisco in the valley, so I’m confident your local Kwick-E-Mart will have them. That said, I don’t really recommend them. While I found it delicious at 10, it pretty much just tastes like chocolate milk with extra sugar. But, it stirred up memories so that was nice. Absolutely wonderful post, Bloggess, absolutely wonderful. And BTW I had one of those Yogi shirts (no Mantle shirt). And Yoo-hoo is around here occasionally (and is still awful). Thank you, v. I thought of you as I was writing, too … and how you pore over old history and statistics to share the past with us. It’s so exciting to be looking over an old story and you find something new just sitting there in a box score waiting for you to discover it. I don’t have the shirt. Outgrew it 50 years ago and into the Salvation Army bin it went. Maybe somewhere so other kid has it, but it’s surely worn to threads by now. Hi JB … Yup, 1973. It’s very weird to have such a significant baseball rule that only applies to half the teams in the MLB. But, I like weird, so I’m good. You sacrificed for us! You drank a Yoo-Hoo! 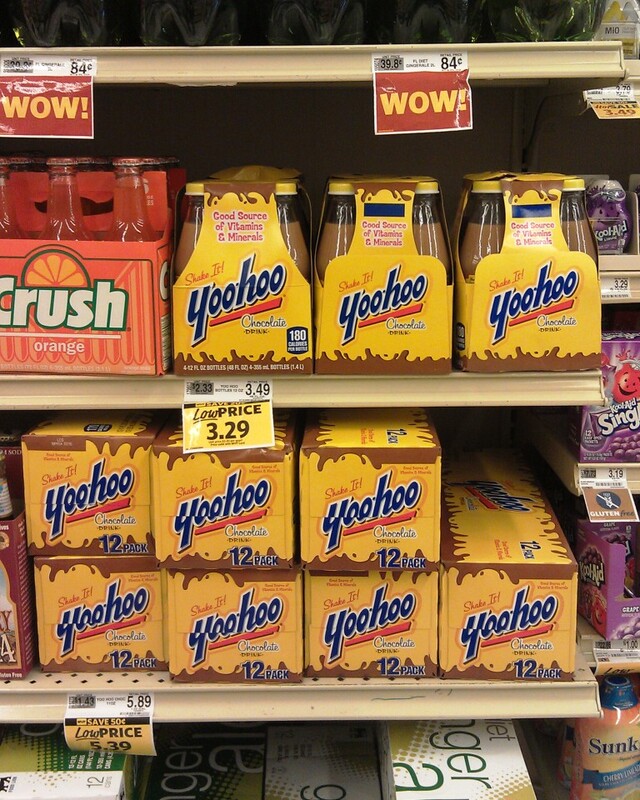 Lawd ha’ mercy…when I was a kid I ran the other way from Yoo-Hoo. It never reminded me of baseball in any way. The other day though, I dredged up from my memory banks the last game of the 1972 World Series. Since the O’s had been eliminated, I wanted the Reds to beat the A’s. And as the Big Red Machine went down in 7, I remember my mom laughing as I cried in front of the TV. The saddest baseball memory I ever had. I realize that story had just about nothing to do with your post, but I felt like I needed to tell the Bloggess the tale. Now, no more Yoo-Hoo for you! Plus, February is around the corner, which is one good thing about the New Year coming in. Yoo-Hoo. As I grew up, I heard about Frosty Malts at Twins games. I go to Redhawks games to treasure the sound of wooden bats. I agree with Editor/Husband; the boy is bound to get a little restless at some point. Thanks for this posting. It made me remember. Since the subject came up, one of the reasons I find it hard to care about college baseball (and Berkeley, where I live, has a good team- last time I looked) is the use of aluminum bats. It’s very odd, even to me, but I’m simply put off by the sound of a hit that goes “clang”, instead of “crack”, when the ball is hit. It’s just not right. On the other hand, aluminum bats don’t explode into a hundred sharp fragments, either, so, there’s that. This is one of the best things I’ve read in a while! Growing up, I always had a fascination with both baseball and history, but it wasn’t until I was older and started putting the two together than I realized why both appeal to me. This post conveys a lot of that. 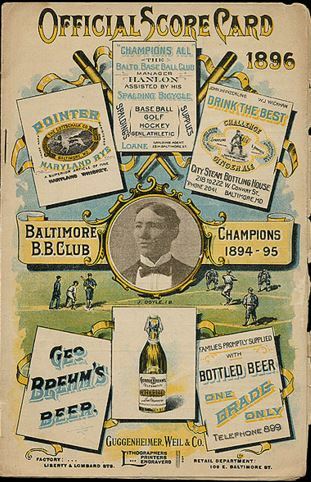 In the official rulebook for Rotisserie Baseball (back in the pre- or at least infancy-level Internet days of yore), it was stated that the champion was supposed to take a Yoo-Hoo shower. I don’t have a copy anymore, so I can’t quite recall why. Maybe somebody can hunt down Daniel Okrent and ask him if he remembers. oooh, Pickle, you’ve intrigued me with your comment. I’m on it — let me see what I can find about the Yoo-hoo shower. (Although it sounds horrible … you might be sticky for days! Plus, you’d attract ants … but still … I must find out!) Thanks!